Covenant Soup Kitchen is a non-profit organization with a very small staff. We could not be successful without help from the hundreds of dedicated volunteers and community service workers we see each year. We would love to have you join us! please call us at(860) 423-1643! We would enjoy talking with you about volunteer opportunities which might appeal to you. Please note that we usually schedule volunteers one-two weeks out. Feel free to call (860) 423-1643 and we will let you know if someone has called out and left an opening sooner than that! Soup Kitchen Assistants - Monday through Saturday Breakfast starts by 8:45am and ends at 11:00am and lunch is offered from 12:00pm until 1:00pm. Volunteers are needed before meals to help with food preparation, during meals to help serve, and afterward to help with clean up. Emergency Food Pantry - Help is needed in the morning to sort donations and stock the pantry shelves, as well as in the afternoon between 2-4pm when families arrive to shop. Drivers - We need drivers to pick up baked goods and sometimes other items which are generously donated by our local grocery stores. People with trucks or sport utility vehicles are needed from time to time to pick up larger donations and deliver them to the Soup Kitchen. Maintenance - There are always odd jobs and repairs needed in our building, as well as routine and preventive maintenance. Gardening - If you have a green thumb, donations of fresh produce and/or help with landscaping are always appreciated. -We generally schedule volunteers Monday-Friday between 9am and 4pm. We also have opportunities for some Friday evenings between 4-6:30pm to assist with Friday Night Dinner. There are opportunities on Saturdays between 9am - 2pm and on Sundays between 8:30am - 1pm. -If needed in the kitchen, you would be assisting our regular volunteer kitchen crew in getting breakfast and lunch prepped, set up and served. -If needed in the Emergency Food Pantry, you would be assisting with checking dates, sorting donations, stocking shelves and doubling bags, so that the pantry is ready and/or assisting guests coming in to shop for their families. -There are often other projects going on, so you may be asked to assist in those areas. -If you have any health concerns or limitations, please let us know and we will happily work with you to find a task that with which you feel comfortable. -Staff and volunteers eat lunch from 11:30-12pm and we welcome you to share in the meal we serve or bring your own lunch. We serve guests from 12-1 and clean up from 1-2, or until we are finished. We supply gloves and aprons if you are in the kitchen working with food. We ask that you please wear comfortable clothes which you do not mind getting wet/dirty, t-shirts (no tank tops), closed toe shoes (no sandals or slides). Please have your hair tied back and covered with a hat - baseball caps and knit hats are fine. We also have hair nets available, if you do not have a hat. Please do not bring valuables with you. CSK is a very busy organization and it is difficult to keep track of people's belongings. You can park on Walnut Street, in the municipal parking lot on Walnut Street, or the parking lot on the corner of Valley Street and Bank Street, across from the Fire Department and Police Station. Tickets will be issued if you stay in a space longer than allowed, so check the signs and move your vehicle as necessary. You may not park in the parking lot directly behind our building, which belongs to the Post Office. Please enter through the double red doors at the back of our building and come down the stairs. Please sign in on the clipboard of green paper near the copier in the back and make yourself a nametag to wear. Important - If you need to track your hours for any reason (school, work, court) then you will need to also sign in in the notebook in the back. A staff person will set you up with a log sheet and it is very important that you remember to have a staff person sign you in and out each time. Only hours that have been initialed by staff will be counted and written on your verification letter at the end of your service. After you sign in, please check in with the staff in the kitchen to see if you are needed there and if not, you will be directed to the Emergency Food Pantry for another task. We understand that things happen and you may not be able to get here as planned. If you are ill, please stay home and get better! Please call or e-mail to let us know that you cannot make it before your shift is scheduled to begin. We need time to get other volunteers to fill in, so at least a day ahead of time is preferred, if at all possible. Please sign out and leave your name badge in the container. If you are not returning, please discard the paper insert and return the empty holder to the container with the blank inserts so a new volunteer can use it. We know that you could be volunteering anywhere and we are very grateful that you choose to be here. If you have any questions, concerns or suggestions, please do not hesitate to speak with a staff member. Your feedback is important and will help us make Covenant Soup Kitchen a better place for everyone. 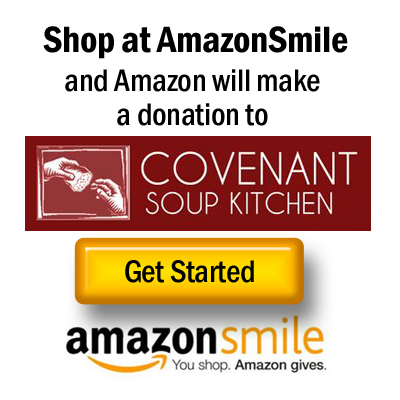 You can also e-mail kclark@covenantsoupkitchen.org or phone 860 423 1643 ext. 10 to discuss your thoughts.